1. Combine all ingredients except the lamb shoulder to make the dry rub. 2. Rub surfaces of the shoulders with the dry rub. 3. Place the lamb shoulder on a rack in a roasting pan. Pour about 1/2-inch of water in the bottom of the roasting pan. Cover with aluminum foil and place in a 300 degree F oven for 5-7 hours or until the shoulder is very tender. Remove the lamb from the rack, trying to keep it in one piece if possible, and transfer to a disposable aluminum pan. (If the lamb breaks apart a bit, no worries -- it just means that it is very tender!) Pour the pan juices from the roasting pan into a bowl and reserve. 4. If you have a grill with different heat zones, heat only part of the grill. Place wood pieces over the heated part and the disposable container with the lamb on the cool part. Close the lid and let smoke for 1 � hours. If your grill does not have zones, heat the grill with wood pieces. When the wood starts to smoke heavily, put the tray of lamb on the grate and lower the heat. Very importantly -- put about 1/4 inch of water in the bottom of the pan so it does not burn. Close the lid and let smoke for 1 hour. Check periodically to be sure that there is always some water in the bottom of the pan and that the lamb is not burning. (Depending on the grill, it may be advisable to first soak the wood in water so that it smokes a lot and burns slowly. 5. Decant the reserved lamb cooking juices into the fat and liquid portions. Discard the fat. 6. Tear apart the lamb or chop into bite-sized pieces. Mix with some of the decanted lamb cooking juices. 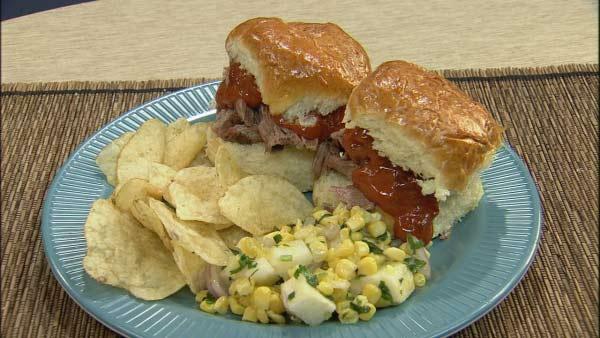 Serve with chipotle BBQ sauce and on a bun or on its own with some slices of white bread. 1. Combine all ingredients. Keep refrigerated until needed.